You are looking there at my latest nightmare. It was 4.5 kg San Marzano and 1.1 kg cherry tomatoes to process as quickly as possible, before the blight set in. Here's the links to the recipes that inspire me, loosely translated underneath. Of course, you need to sterilise the jars and the preserve as per best practice. Slice the tomatoes, cover in salt for 24 hours, squeeze them dry, cover in white vinegar for 4 hours, squeeze them dry again. Place in a jar with pepper, oregano, slices of garlic and a few bay leaves before covering in oil. Blanch the tomatoes, peel them and remove the seeds. Add the juice and zest of a lemon and half a kg of sugar for each kg of tomatoes. Leave the mix to infuse in a bowl for 12 hours, then cook and can as you would do any jams. 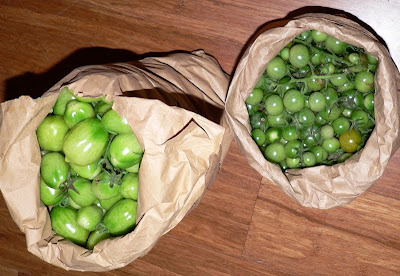 You need properly green tomatoes so they do not soften up too much with time. Rinse and slice them in stripes, which you will put in a large glass or ceramic bowl. Cover in salt and with clean hands stir it in well. Cover the bowl and leave for 24 hours. After that, pour them in a colander or sieve, and, in order to squeeze them well dry, place some heavy weight over them (i.e. a pan full of water). Cover them and leave for another 24 hours. The next step is to cover the dry tomato strips in vinegar in a clean bowl, untangling them with a fork so that the maximum surface is exposed to soak up the vinegar. Leave them for another 24 hours. Squeeze them dry once again. Aside, mix some finely chopped parsley (a herb mill is ideal), garlic, chilly, oregano and extra virgin olive oil. Pour the mix on the dry tomatoes, stir it in, cover the bowl and leave for another 24 hours to soak up the flavours. Finally, it's time to can them: put a little oil in the bottom of the jar, then add the toms, pressing them well. Cover with oil, seal and keep in a cool and dark place for at least 3 months before using.